With the 2017 Toyota Tundra, you get a mix of rugged capability and modern luxury, making it a great all-around vehicle. 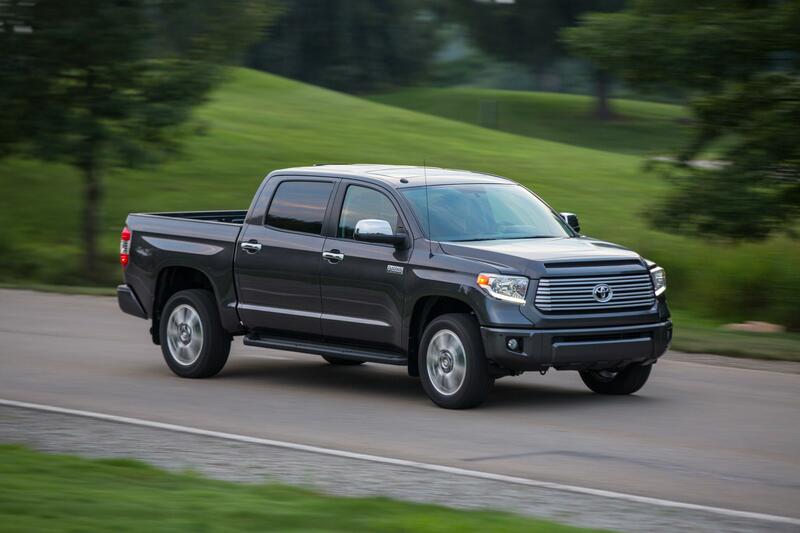 Thanks to plenty of functional features, the Tundra is great for taking on jobs of all types. This truck is also great for off-roading or getting through inclement weather. Roomy cab options and other amenities ensure all passengers stay happy and comfortable, no matter how rough the journey. Toyota offers the 2017 Tundra with a regular cab, double cab or CrewMax. Standard, short and long beds are available. Two engines can be had for the truck. First off is a 4.6-liter V-8, which is rated at 310 horsepower and 327 lb.-ft. of torque. The other is a highly capable 5.7-liter V-8. It's tuned to put out a maximum 381 horsepower and 401 lb.-ft. of torque. A six-speed automatic transmission with uphill/downhill shift logic is mated to either engine. The standard suspension setup involves a double wishbone for the front, plus a live axle and leaf configuration in the rear. At all four corners incorporate gas-filled shock absorbers. The antilock brake system includes massive 4-piston front calipers, providing strong and reliable stopping power. All models come with an automatic limited-slip differential, hitting the brakes on wheels that have lost traction, without reducing engine power. Bundled with the four-wheel-drive system is active traction control, also utilizing the brake system without affecting throttle input, boosting performance further. For extreme off-road capabilities, the 2017 Toyota Tundra TRD Pro is an excellent choice. It adds Bilstein shocks tuned for trail duty, special wheels and tires, a tuned exhaust and a heavy-duty exhaust. A unique grille, black badges and distinct tailgate make it easy to tell apart from the rest of the lineup. Proving the 2017 Toyota Tundra is built to work hard, the truck can tow up to 10,500 pounds when equipped properly. The trailer hitch includes 12 high-strength bolts which are part of the frame, providing incredible durability. The 4/7 pin connector is integrated right into the rear bumper, so you always can tow whatever trailer needed. All 5.7-liter V-8 models also have an integrated trailer brake controller, letting you control the towing experience with greater ease. Trailer sway control, which automatically controls the brakes and engine torque output, is included on all Tundra models. While taking on especially tough jobs, a combination meter lets drivers keep a close eye on oil pressure, fuel level, coolant temperature and battery level. Safety is addressed in several key ways. All 2017 Toyota Tundra models have the Star Safety System, which combines six active innovations such as traction control and brake assist to help drivers avoid tough situations. Numerous driver assistance technologies are also available, including blind spot monitoring and rear cross-traffic detection. Eight airbags are standard, providing protection for occupants in the front and rear seats. Even the interior of the 2017 Toyota Tundra is designed to help you do more. The rear seat bottom cushions fold up, making it possible to transport cargo in the cabin. Amenities such as leather upholstery, seat heaters and dual-zone automatic climate control are available.